It’s time to think of brighter & warmer days! Even if you’re not travelling this winter, you can take advantage our Cruise Wear selection by shopping or by donating/consigning your gently used cruise wear clothing! Our January 29, 2018 General Meeting brought our members out on a snowy day to listen to guest speaker Mr.Gary O’Neill, Executive Director of Kerr St. Mission. We learned of all the great work that Kerr St.
Once a year our Grants Committee holds an Open House for local charities at our wonderful May Court Nearly New Shop to showcase where the majority of the funds we raise come from. What a fabulous evening it was! 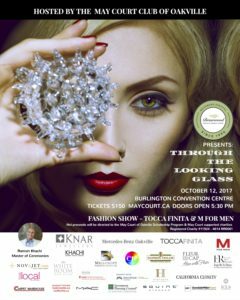 May Court’s Through the Looking Glass Fashion Show with fashions from Tocca Finita and M for Men, fundraiser was a smashing success!